The Betterbatt company was struggling to align their innovative inventory management mechanism with Magento eCommerce technologies. Due to the company’s rapid growth, there was an urgent necessity for changes to be implemented as soon as possible. While Aitoc was responsible for both fundamental technological changes and everyday technical task management, Betterbatt got a chance to focus on building effective business and customer service strategies. Liam, the CEO of Batterbatt, was struggling to create an online store with the most effective battery filter system on the Australian market. The concept was simple and elegant. Choosing a battery or a charger, customers rarely know the exact battery or charger model. Things they do know are the device type, the brand of the manufacturer and the model of the device. Liam decided that those were the parameters that should be used for a truly user-friendly search and filter system. He brought this idea to the table and asked Aitoc’s specialists for advice. Having gathered requirements, our development team conducted a thorough analysis and came to a conclusion that such functionality could not be implemented without changes in inventory management and catalog systems. The standard Magento catalog has a very linear structure, useless in the Betterbatt case, as all parts of their project required the creation of very peculiar logic, unavailable by default or in form of extensions. We built a complex inventory management system - a mutual dependency between device types, brands, device models and products. As long as it was a completely new element in a default Magento setting, it was necessary to apply architectural changes in order to make it compatible with other backend elements. We’ve completely reshaped the architecture by developing all the connections with other subsystems. Due to drastic changes in the inventory management processes some subsystems couldn’t function properly at all, so we developed them from scratch as well (e.g. refund system). Unusual logic does not change the fact that one battery type equals to one product page (with quantity and other details) on the admin side. We made editing very easy for admins, as they could add the information only once and the changes are shown on all the pages this battery type is featured. Still, some product types (e.g. power banks) are placed according to the standard Magento catalog rules, because in this case it is not logical to build a device based filter and the complex search system does not make any sense. In pursuit of excellent customer service, Betterbatt decided to build a reputation of a provider of exceptionally high-quality batteries. That’s why we created a system of detecting and returning batches of dysfunctional batteries back to the producing factory. In this system, the stock is divided into batches, so when a customer returns a bad battery, the BetterBatt team tracks what batch was it from and returns the whole batch (including the dysfunctional item) to the manufacturer to minimize the risk of repeated customer returns. In comparison with the one-step delivery process in the standard Magento, BetterBatt custom delivery process is divided into two steps. For the convenience of the Betterbatt employees, the first step is picking, during which the information about the location of multiple orders in the warehouse is gathered. It is done with an intent to speed up their actions at the next - packing - stage when employees collect all the items and send individual delivery packages to clients. One of the top priorities of BetterBatt was high productivity of the website. To ensure this, we executed its transfer to the Rackspace hosting, well-known for their deep expertise in the eCommerce field. Moreover, to secure its 24-hour uptime we allocated its front end and back end parts on distributed servers to virtually exclude every opportunity of the website going down during high load. 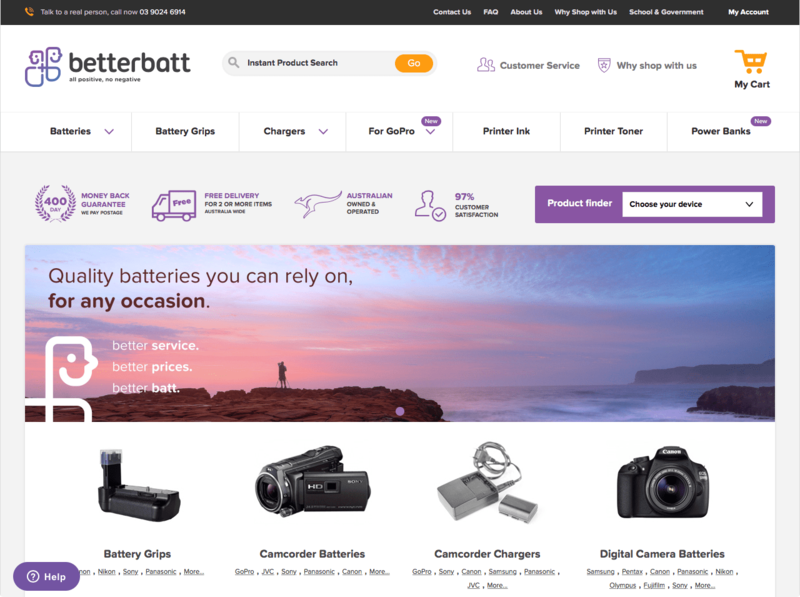 The collaboration of our design, development and support teams with BetterBatt resulted in building a scalable high-speed eCommerce solution with a unique catalog structure, which let them become #1 supplier of batteries in their region.